When I think of breakfast in Kelantan, laksam is the first thing that floats to the top of my mind. I will never forget my first time eating it a couple of years ago, fresh off the plane from Kuala Lumpur and at a frightful hour in the morning. I recall the supercilious expression of the roly-poly vendor as she hovered over her tray, stacked high with silken scrolls, white as the rice used to make them. I recall her lifting up one of these scrolls with plastic-protected fingers, holding it above a shallow bowl and snipping it coolly into fat, jiggly coins. A creamy blanket of coconut fish gravy (kuah) was promptly pulled over them, a shade of grey both soothing and ominous, followed by an enlivening scattering of chopped herbs (ulam). Just the thought of it affords great comfort. 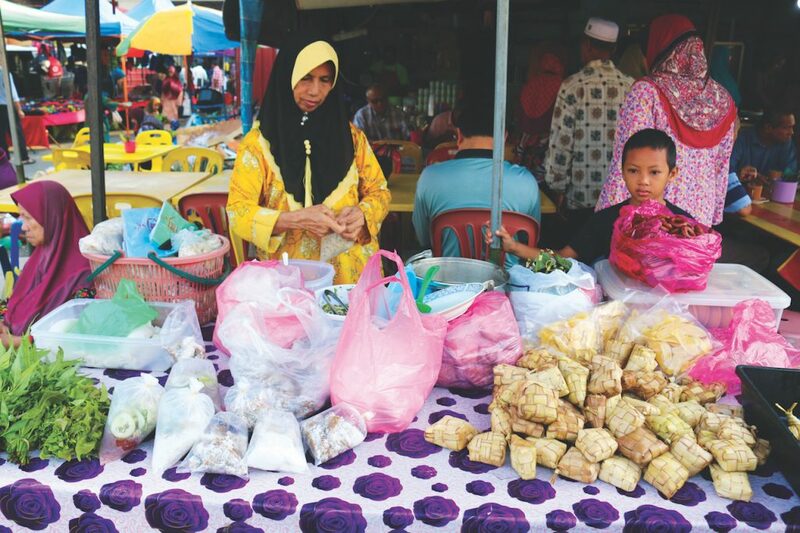 Laksam had been on our breakfast agenda at Kota Bharu’s central market—the iconic Pasar Siti Khadijah—where the fantasised fruits of a forage stacked its aisles. Unfortunately, after crawling through the congested roads surrounding the market complex at least three times in search of a parking space, this succulent little idea was shot to hell in a beribboned hand basket. To the soaring vocals of Celine Dion, Kun, my companion, exercises burning patience as he frees the car from one last clot of traffic. He apologises unnecessarily, and just as my lips manage the words, “Don’t worry about it”, my stomach betrays me with a thunderous groan. The gentleman that he is, Kun does his utmost to conceal his amusement. Laksam noodles, before they turn into Laksam. 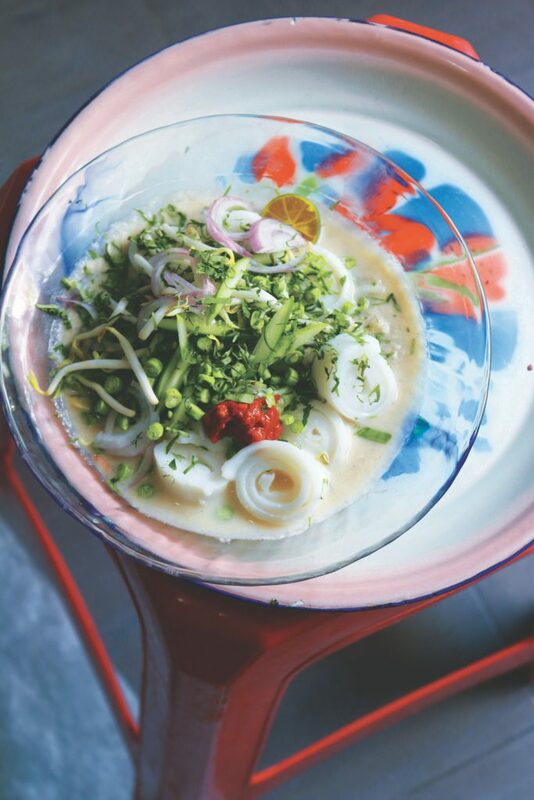 Laksam, the stuff of breakfast dreams. We find ourselves slowing down not five minutes later along Jalan Wakaf Siku, in the heart of the city, at the sight of a roadside eatery. Kun brings the vehicle to a halt along the curb within spitting distance of a Maybank outlet. “That’s everybody’s landmark,” he remarks, pointing at it. The atmosphere of the eatery, operated by a group of handsome Indian gentlemen, is laidback, as with all coffee shops. Such an establishment is called kedai kopi in Malay; kopitiam in Chinese. 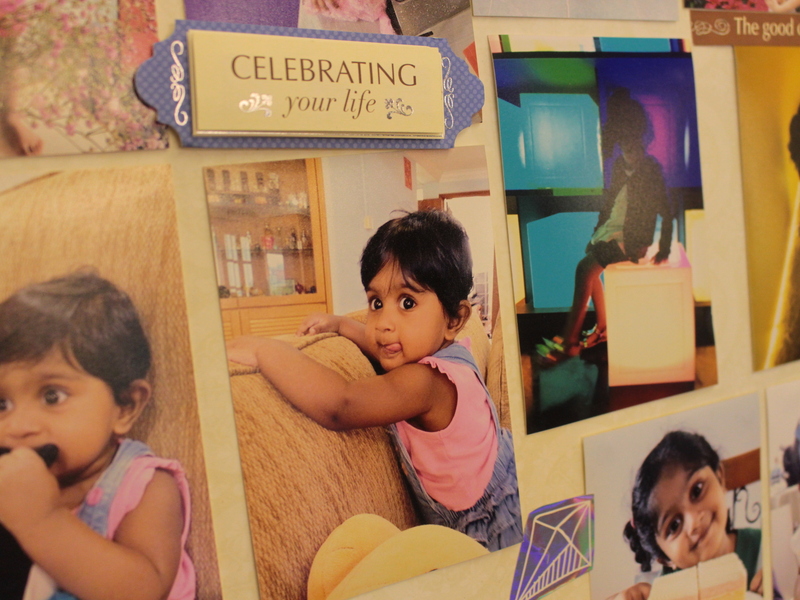 We pick a table close to the open kitchen counter, one bearing a pair of empty lip-stained glass mugs and an engine-red melamine plate of doughnuts in faded veils of sugar and robust wedges of bekal, a baked, mustard yellow, tapioca cake. A richly bearded bloke arrives shortly after, expelling the mugs and wiping the table clean with a towel in one fell swoop. Coffee shops experience high traffic, so efficiency and agility are mandatory traits for any worker. He draws a pencil from behind his ear and a scrap of paper from his pocket and applies one to the other while Kun engages him in the local vernacular. Our meal now imminent, Kun finally seems at ease. Nasi means “rice”, lauk means “viand”, and together they refer to a portion of plain rice partnered with a curry of mackerel tuna perfumed with galangal and turmeric. (In standard Malay, mackerel tuna is called ikan tongkol. In Kelantan and Terengganu, it is referred to as ikan aye.) It is this that we shall be having for breakfast. Two brown paper parcels soon arrive and are promptly unwrapped. We spend the next few moments in a capsule of appreciative silence, mouths full with firm, delicately spiced fish and fluffy, soft rice interspersed with sips of kopi (coffee) sweetened with condensed milk. When it comes to breakfast in Malaysia, it is wiser to ask yourself what you want as opposed to what is available: anything can be eaten at any time. 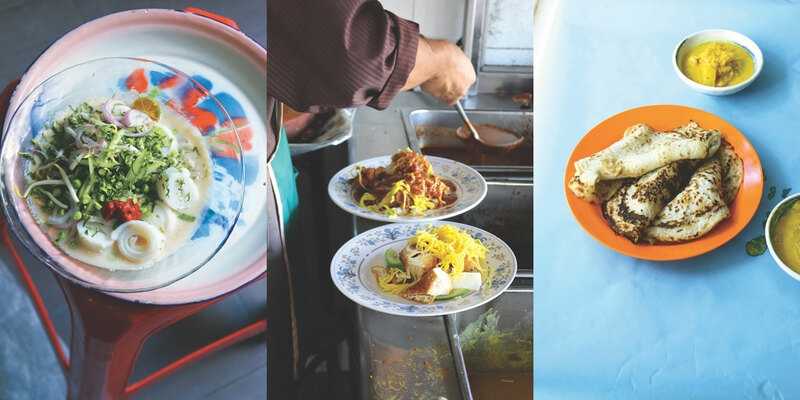 Naturally, there are favourites, and nasi berlauk, as well as laksam, rank as two of Kelantan’s most popular local options, both belonging to the Malay register. And there are more—many more. Pulut pagi, “glutinous rice for the morning”, sees the sticky grains taken deep into amber territory with coconut sugar, then packed into banana leaf cones with grated coconut and adzuki beans. Nasi kapit are cakes of compacted rice that are served either sprinkled with fish sambal or inundated with kuah kacang, a fragrant, brick red peanut sauce. The same sauce may be ladled over yellow egg noodles, cut-up portions of deep-fried chicken, and beancurd in the name of rojak ayam. Then there is the restorative noodle soup that is mee celup, made with a rich broth of beef and chicken, served with finely sliced tripe, crushed peanuts, and preserved mustard leaves. 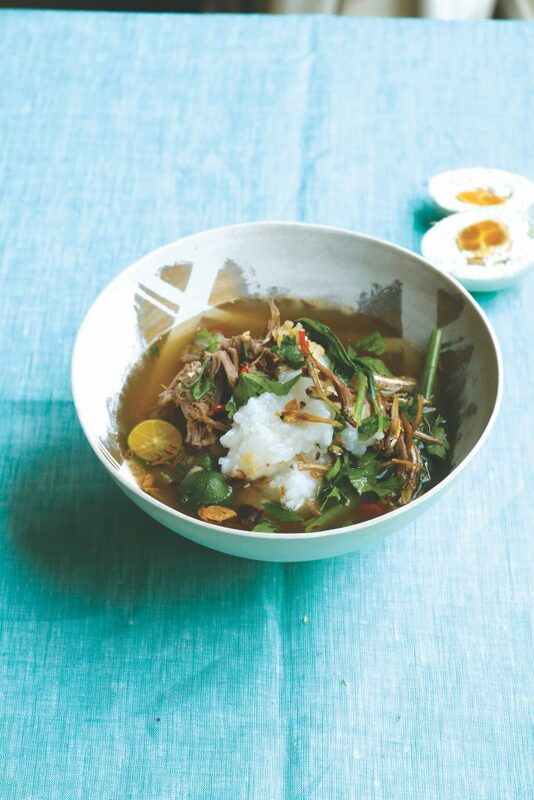 A similar broth is consulted for nasi air, a glorious balm of a rice porridge, eaten with a spritz of lime juice and halves of salted duck egg. Nasi minyak is rice cooked with ghee and scented with whole spices, like clove and cardamom, consistently chaperoned by curries like korma or ayam masak merah. Nasi dagang marries red-flecked rice, redolent of coconut milk, ginger and fenugreek, with a curry of ikan aye quite dissimilar to the one used for berlauk. Kun says that this curry is especially divine with a handful of bilimbi flung into it. Nasi dagang can be found (along with all the aforementioned) in neighbouring Terengganu, but with a difference: a mixture of long grain and glutinous rice is used in place of Kelantan’s beras dagang. An early morning skip through the markets of Kuala Terengganu will reveal other more interesting local breakfast options. 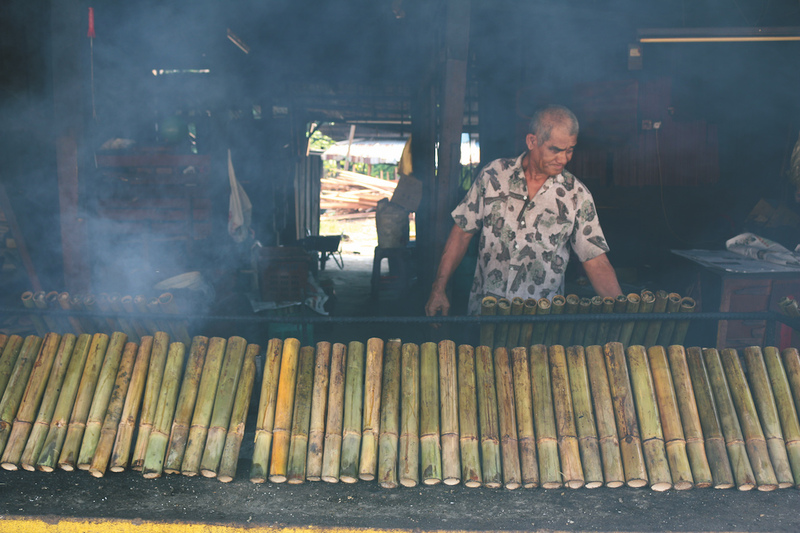 Bekang are griddled cakes of ground rice and egg, with the texture of firm custard, eaten with a delicately spiced, coconutty fish gravy (kuah lemak; “fatty or rich gravy”) or a sauce of coconut sugar and coconut cream (kuah manis, “sweet gravy”), like tropical butterscotch. 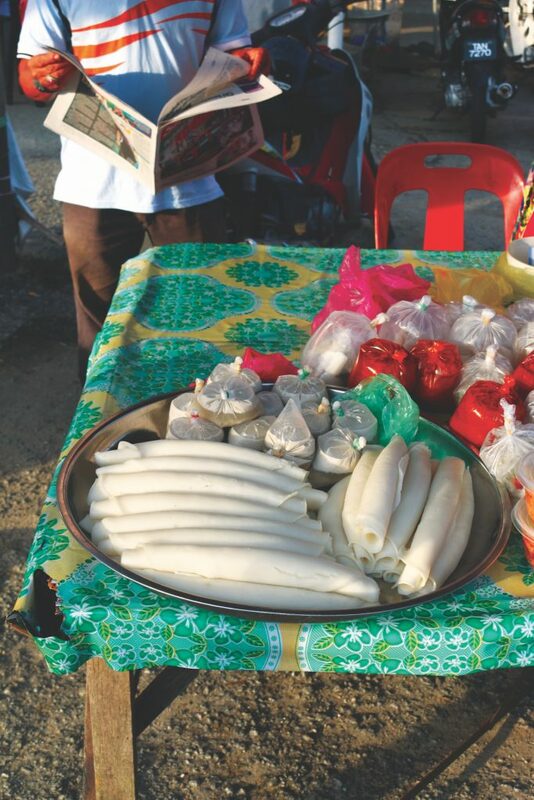 Ketupat sebutir is a flat, round rice cake eaten mainly in kampungs while pulut cawan are balls of glutinous rice in fairy frocks of grated coconut. Both are best eaten with grilled fish, either fresh or salted. Tepung kapur is a steamed cake of ground rice, jaundiced with limestone, and eaten in lozenges in pools of coconut sugar syrup. Apam refers to a steamed coconut sugar sponge that is typically relished with a golden curry-like ointment thickened with flaked fish. There is another apam, more apparent in its South Indian ancestry, also dulcet with coconut sugar, but with a wobbly, honeycomb texture. This gorgeous creature is usually eaten with nothing save a sprinkling of grated coconut. Kuih kayu keramat, “sacred wood”, are puffy, deep-fried fingers of dough reminiscent of churros. Kuih mengagang is a delicious baked green bean custard, koleh kacang, a cool green bean and coconut pudding. 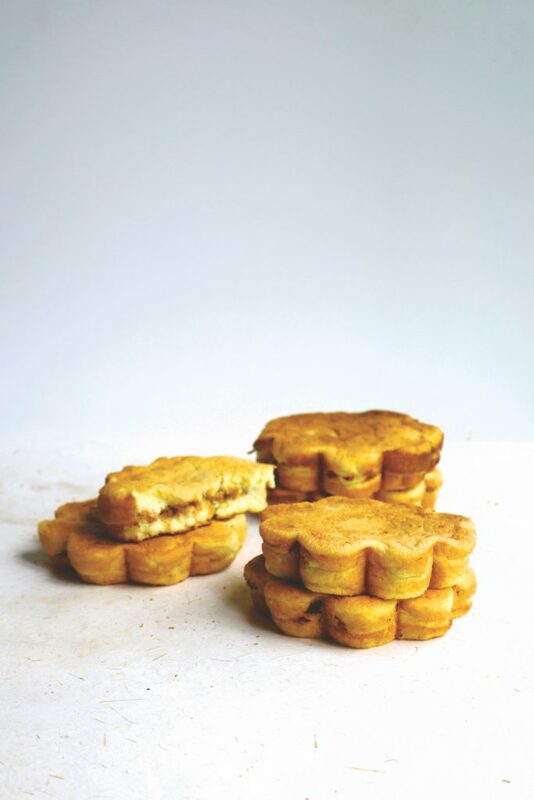 Kuih tembosa are fried half-moon pastries filled with flaked fish or shredded beef, while genung cucur are sweet, deep-fried pastries of ground rice, like flying saucers with frilly edges. Akok berlauk, egg sponges filled with spiced meat. Then of course there is the local laksa, which has a kuah thick enough to smother the rice noodles it dresses. As with the Kelantanese laksam, the gravy gets its body from fish meat. It also contains kerisik, toasted coconut, that has the ability to weave the scent of a tropical beach bonfire into anything it kisses. Pahang’s laksa is slightly similar to Terengganu’s in that it contains both pounded fish and kerisik. It uses more coconut milk, which makes it mellower, and the addition of coriander, fennel and cumin seeds gives it the touch of the spice souk. Nasi kukus, rice that is steamed to order and served with an array of viands, is another favourite Pahang Malay breakfast, along with lempeng niyor, coconut pancakes; nasi lemak bungkus, coconut rice parcelled in banana leaves with crisp-fried anchovies, peanuts and red, unifying dollops of sambal; and nasi kapit with satay. Of the three East Coast states, Pahang has the largest percentage of Chinese and Indians, making it the most gastronomically diverse. The local Chinese and Indian offerings, however generic, receive just as much mention, if not acclaim, as their Malay counterparts. A friend from Kuantan waxed rhapsodically of the food of Sungai Lembing, a tin mining town within the same district, in particular its Hokkien noodle dishes; bak kut teh, pork bone soup; and chee cheong fun, rice rolls named after the pig’s intestines they resemble, apparently made special through the use of local mountain water. 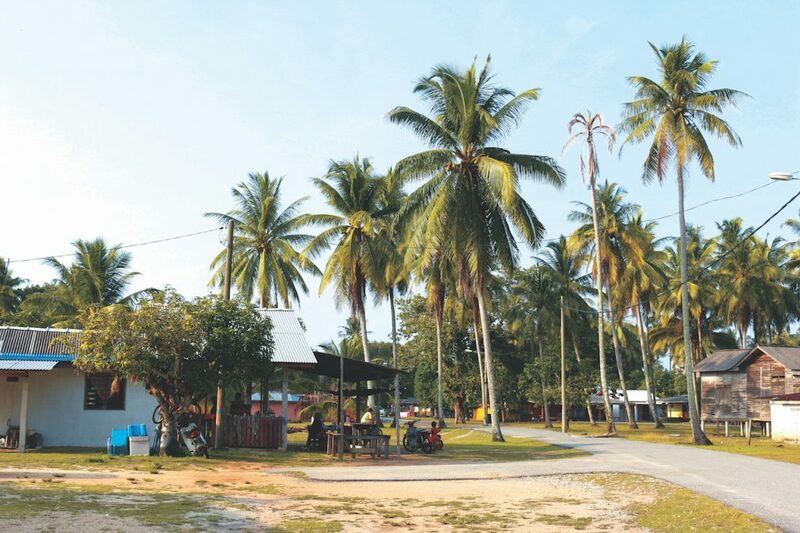 A visit to Pekan might as well not have happened if it did not include murtabak mengkasar, a thin, layered bread filled with spiced minced meat and anointed with beaten egg as it sizzles on the griddle. Durian lovers journeying to Bentong or Raub to feast on specimens of their famous Musang King will surely save room in their stomachs and itineraries for a meal or two, likely involving wanton mee, Hakka ban mee, kuih, Southern Indian fish curries and flaky roti canai typically associated with the mamak. 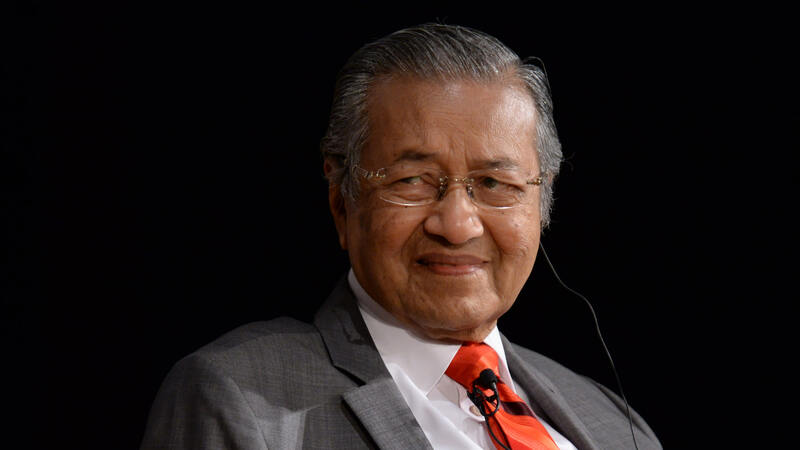 The mamak of Malaysia are of Tamil Muslim ancestry and their food is extremely rare in Kelantan and Terengganu due to their significantly smaller Indian communities. Tracking down a place offering Chinese or Peranakan Chinese breakfasts in these two states is a less daunting task, though options are few and far between. 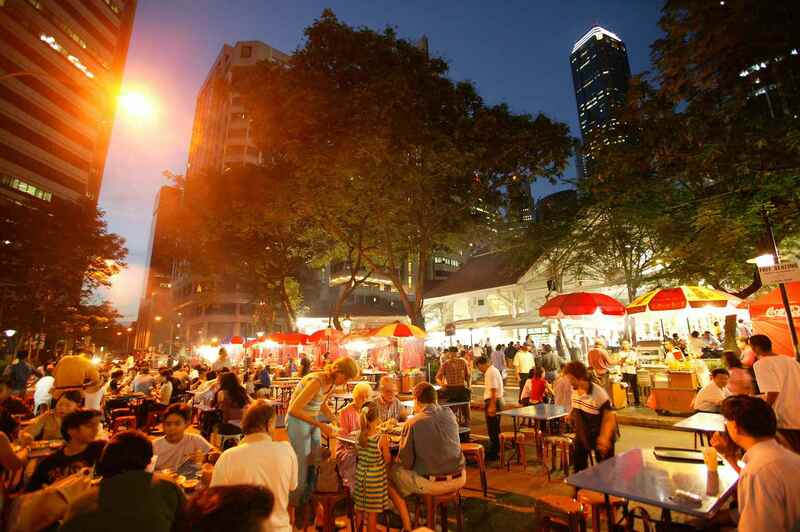 Most kopitiam are halal, serving bowls of beef ball soup and soy sauce chicken noodles, plates of chicken rice and all-too-familiar roti bakar, toasted sandwiches of kaya (coconut spread) and salted butter, amidst a sea of Malay dishes. 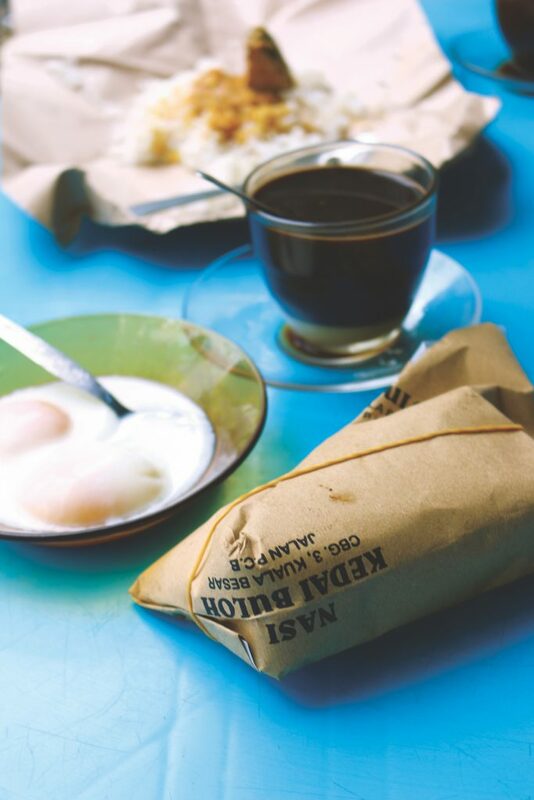 The celebrated Kopitiam Kita in Kota Bharu is the birthplace of roti titab, a square of French toast blessed with a single soft-boiled egg, its white encasing its trembling yolk in a phase-defying state, surrounded by daubs of kaya so as to emulate a sunburst. The fact that non-halal kopitiams exist in Kelantan and Terengganu surprises foreigners. The commendable quality of their char siu and wantons surprises them even more. 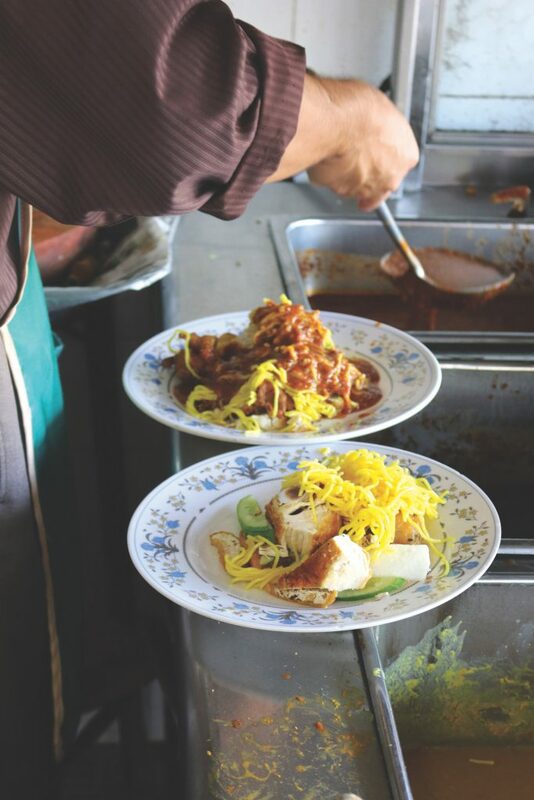 Those dotting Kuala Terengganu’s Kampung Cina are likely to have on their menus loh mee and curry mee, the mee being yellow egg noodles. The former is a Hokkien speciality, containing prawns, crab, pork and a mahogany gravy thickened into a slimy gloop with tapioca flour. The latter has shredded chicken, tau pok (fried beancurd) and a light, sunny curry for gravy. Most of the kopitiam in Terengganu are operated by Hainanese, as are its bakeries. The state is famous for roti paung, a soft, buttery bun, baked and sold in round clusters, a hive of pert, burnished buttocks. It has to be said that a singleton, however plumptious, looks no more remarkable than a dinner roll. The same bun, stuffed with fish sambal and deep-fried, is called paung kiam. In the not-so-distant past, one would have been able to sample soneh, biscuits of egg and ground rice, and beluda, a sweet, brioche-like bread that an artist friend, Naquib Mohammad, brought to my attention. Presently riding on the cusp of his thirties, he does not recall eating either since he was a teenager. Want to send us your thoughts on this story or anything else? Write to us at community@ricemedia.co.